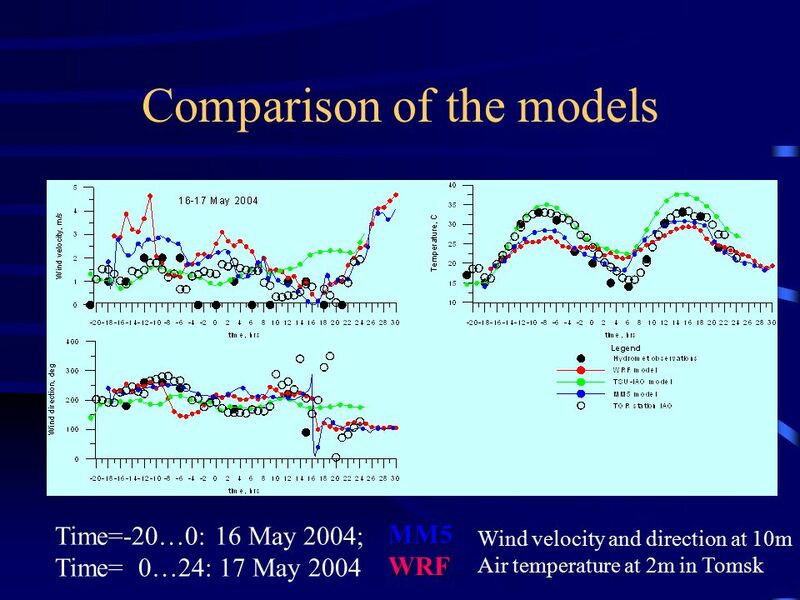 A NUMERICAL PREDICTION OF LOCAL ATMOSPHERIC PROCESSES A.V.Starchenko Tomsk State University. 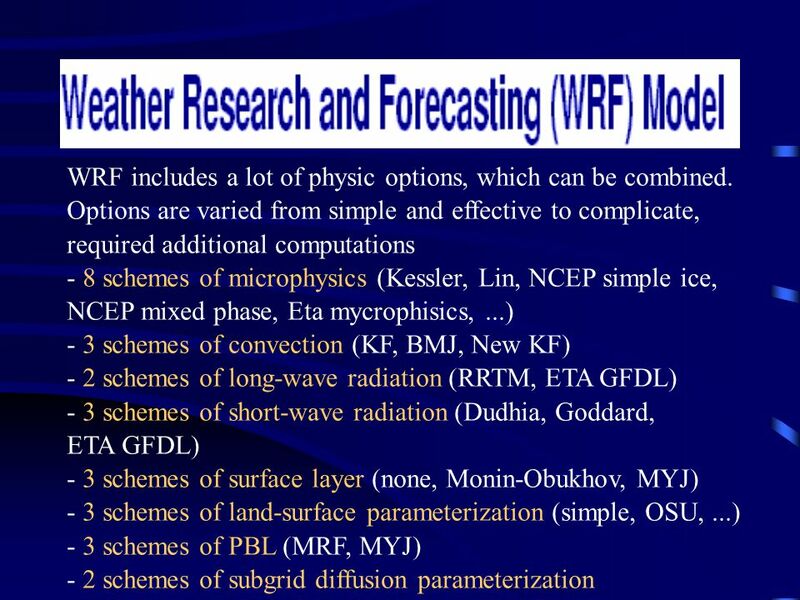 2 Introduction Nowadays a broad range of problems of atmospheric physics, climate and environment protection is solved with application of mathematical modelling approach. 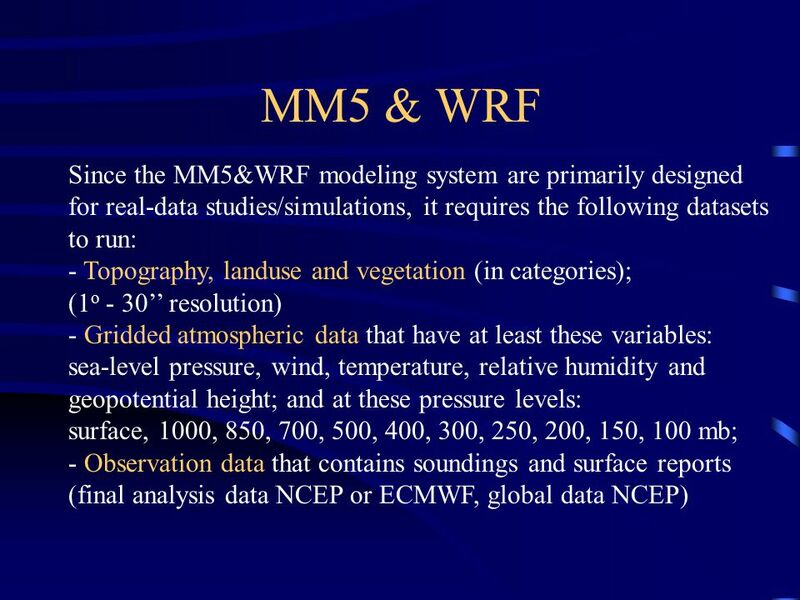 Modelling systems, developed at large centres of atmospheric research, are applied for scenario analysis, weather prediction, air quality investigation. 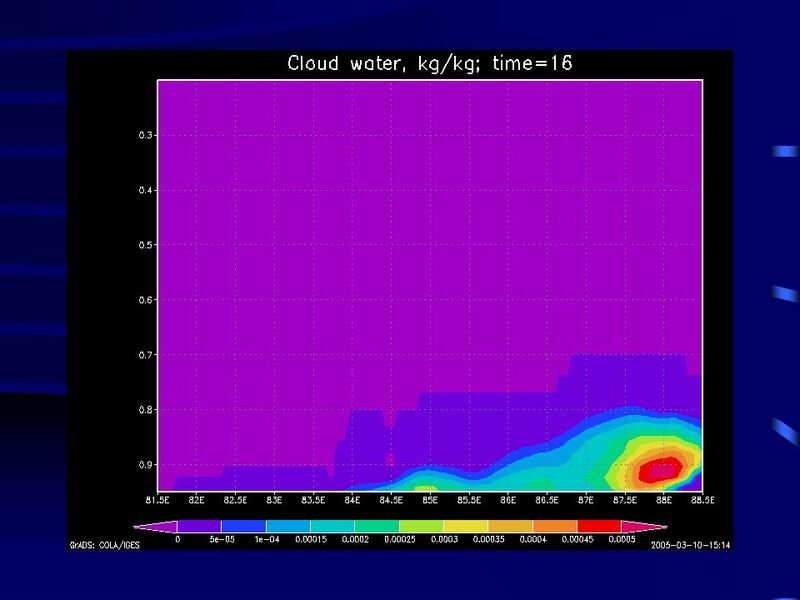 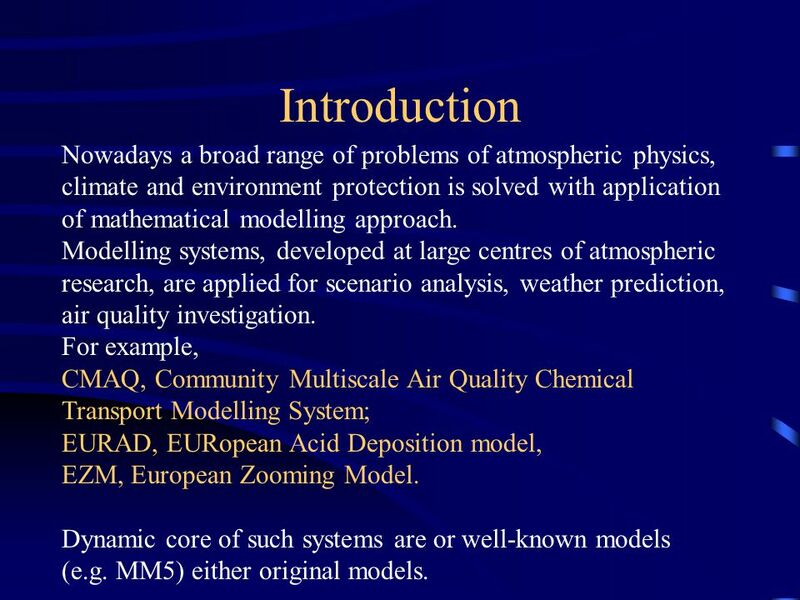 For example, CMAQ, Community Multiscale Air Quality Chemical Transport Modelling System; EURAD, EURopean Acid Deposition model, EZM, European Zooming Model. 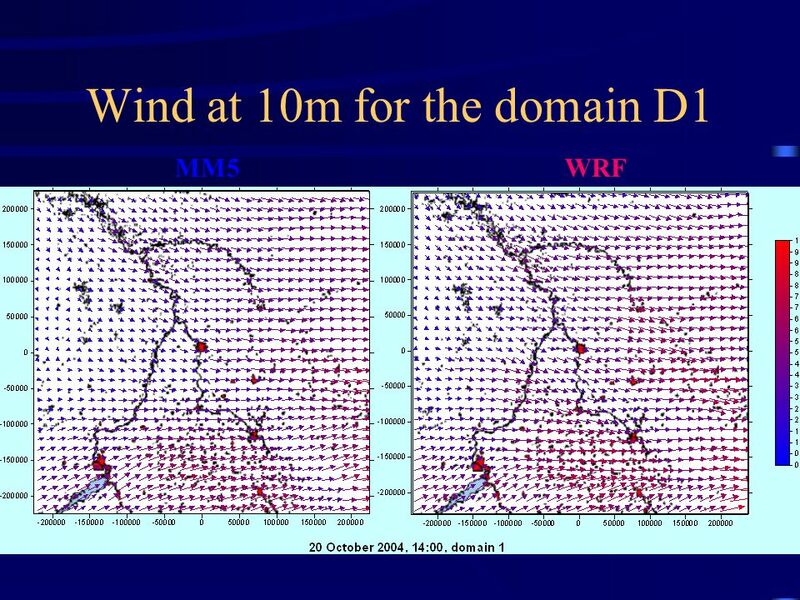 Dynamic core of such systems are or well-known models (e.g. 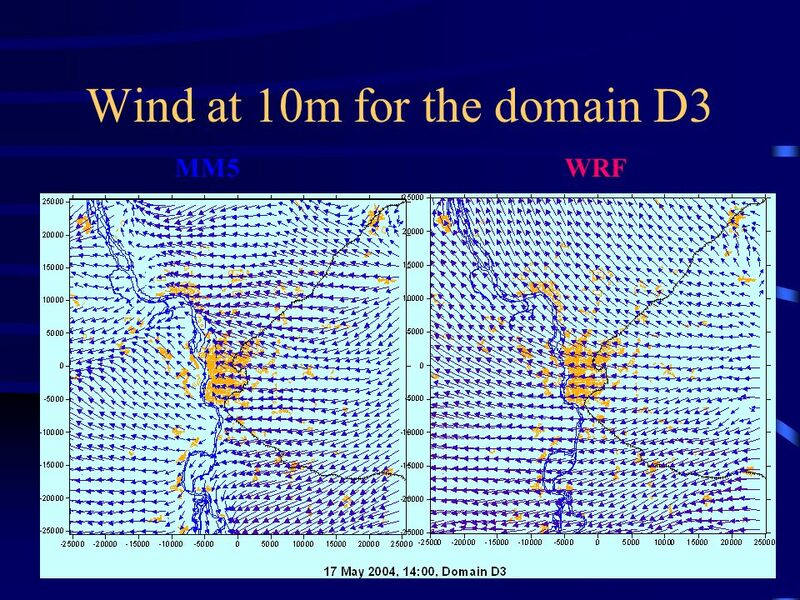 MM5) either original models. 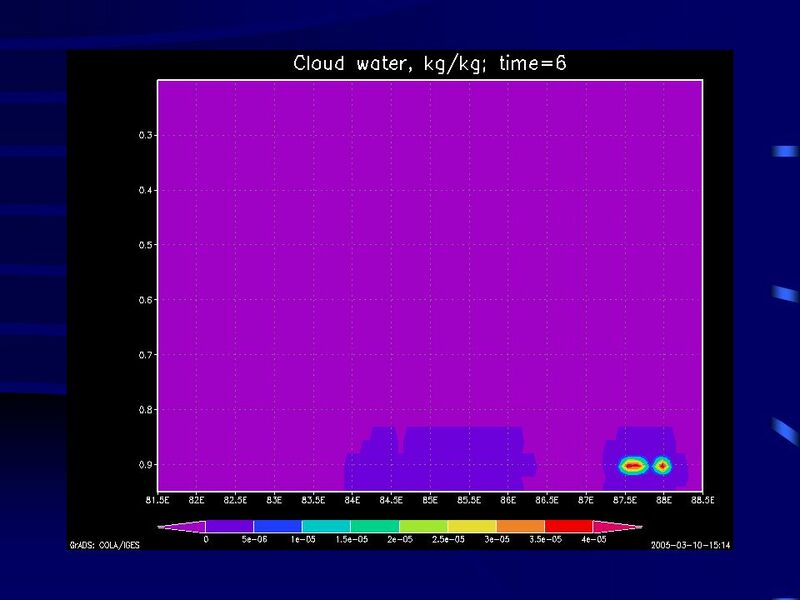 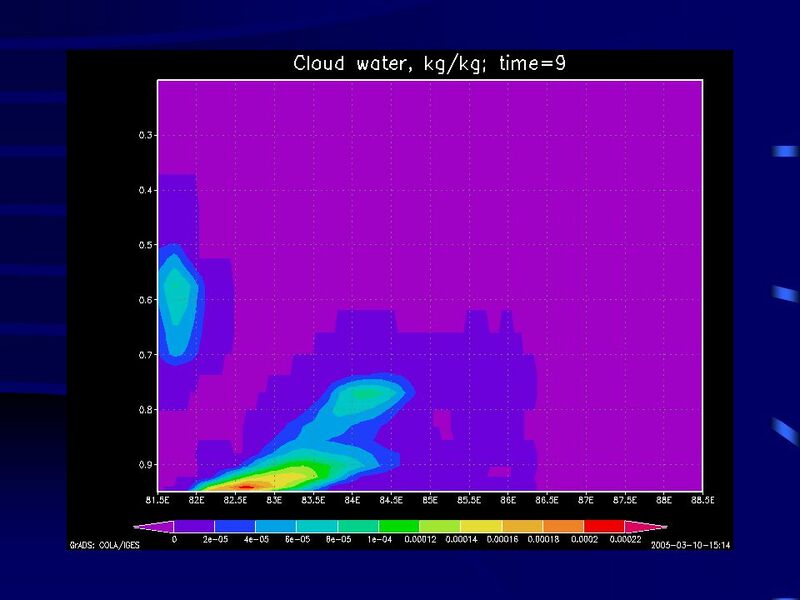 3 MM5 (Mesoscale Model 5) The PSU/NCAR mesoscale model is a limited-area, nonhydrostatic or hydrostatic, terrain-following sigma- coordinate model designed to simulate or predict mesoscale and regional-scale atmospheric circulation. 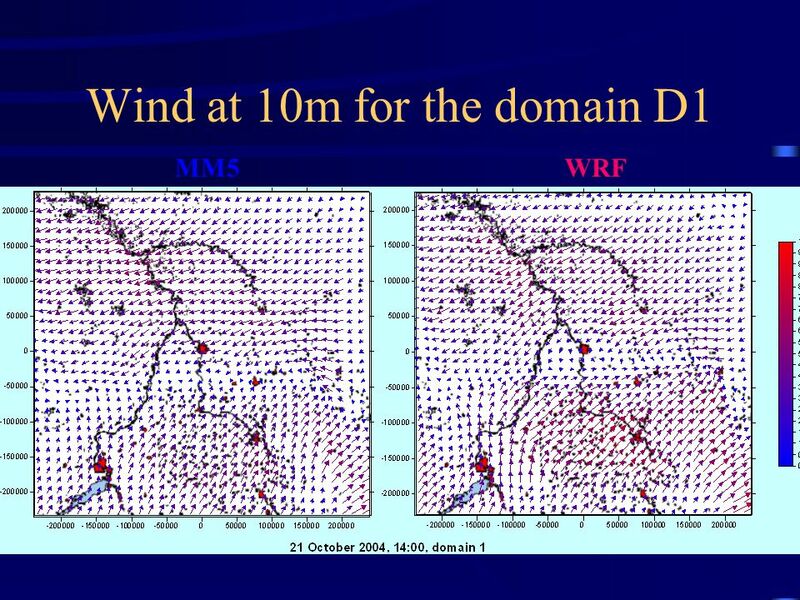 It has been developed at Penn State and NCAR as a community mesoscale model. 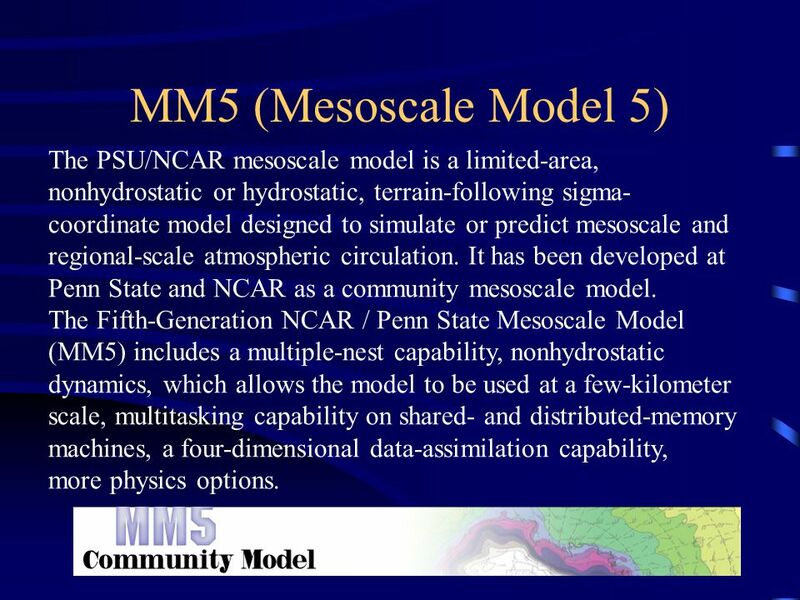 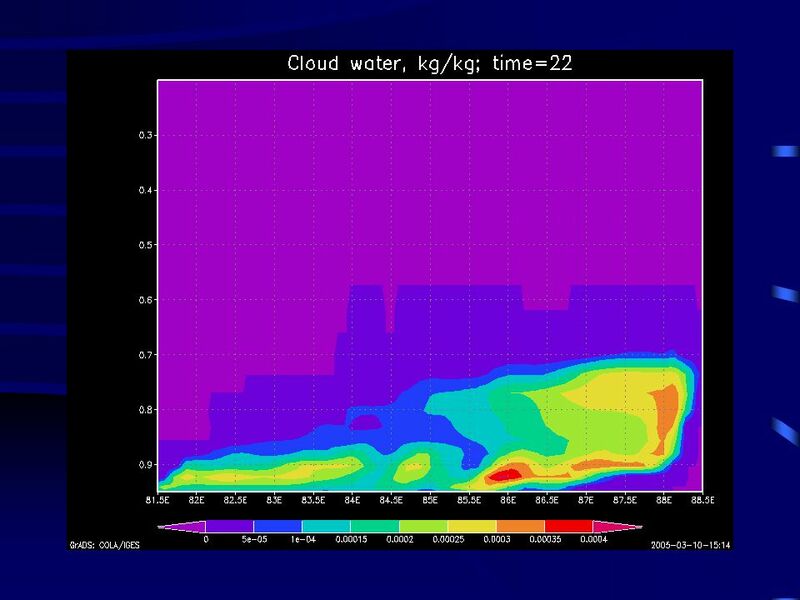 The Fifth-Generation NCAR / Penn State Mesoscale Model (MM5) includes a multiple-nest capability, nonhydrostatic dynamics, which allows the model to be used at a few-kilometer scale, multitasking capability on shared- and distributed-memory machines, a four-dimensional data-assimilation capability, more physics options. 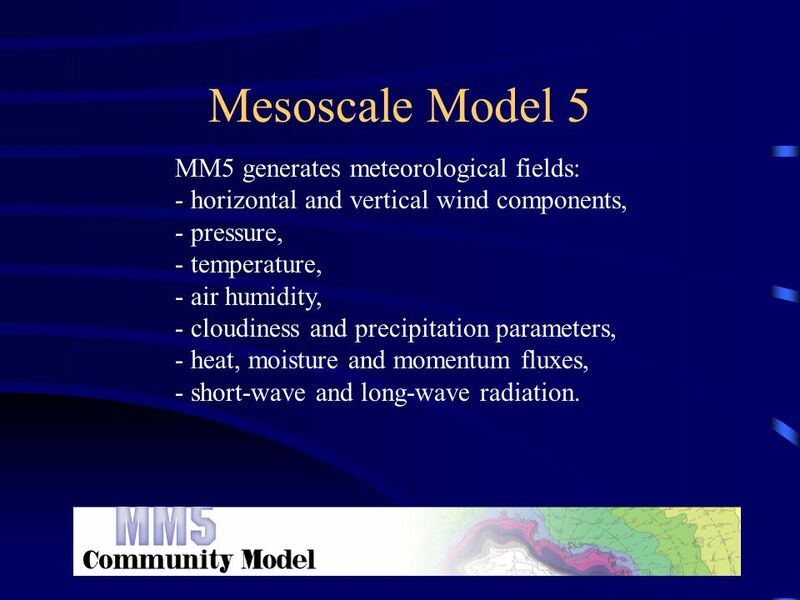 4 Mesoscale Model 5 MM5 generates meteorological fields: - horizontal and vertical wind components, - pressure, - temperature, - air humidity, - cloudiness and precipitation parameters, - heat, moisture and momentum fluxes, - short-wave and long-wave radiation. 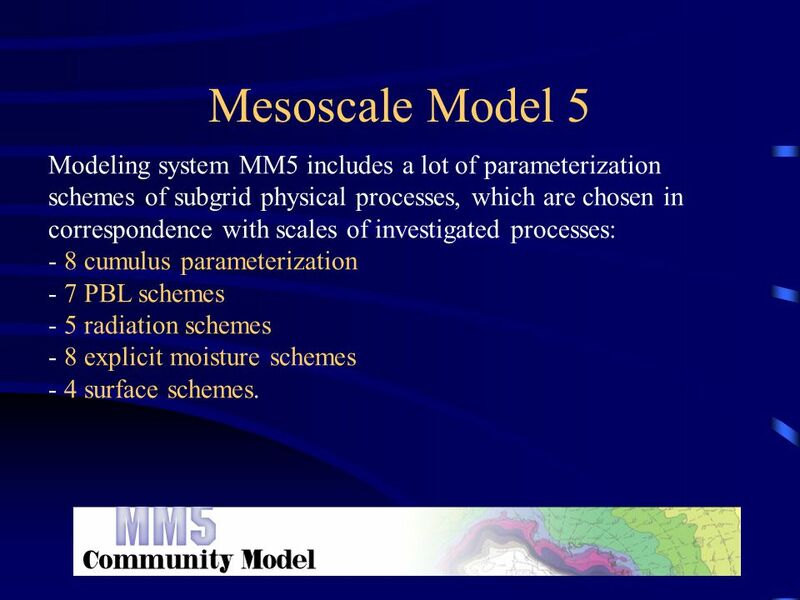 5 Mesoscale Model 5 Modeling system MM5 includes a lot of parameterization schemes of subgrid physical processes, which are chosen in correspondence with scales of investigated processes: - 8 cumulus parameterization - 7 PBL schemes - 5 radiation schemes - 8 explicit moisture schemes - 4 surface schemes. 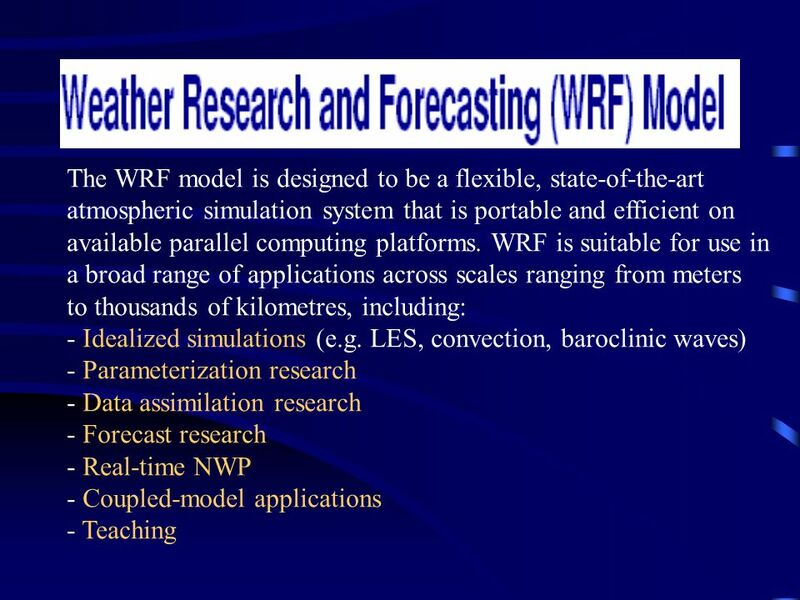 6 The Weather Research and Forecast Model is a next-generation mesocale numerical weather prediction system designed to serve both operational forecasting and atmospheric research needs. 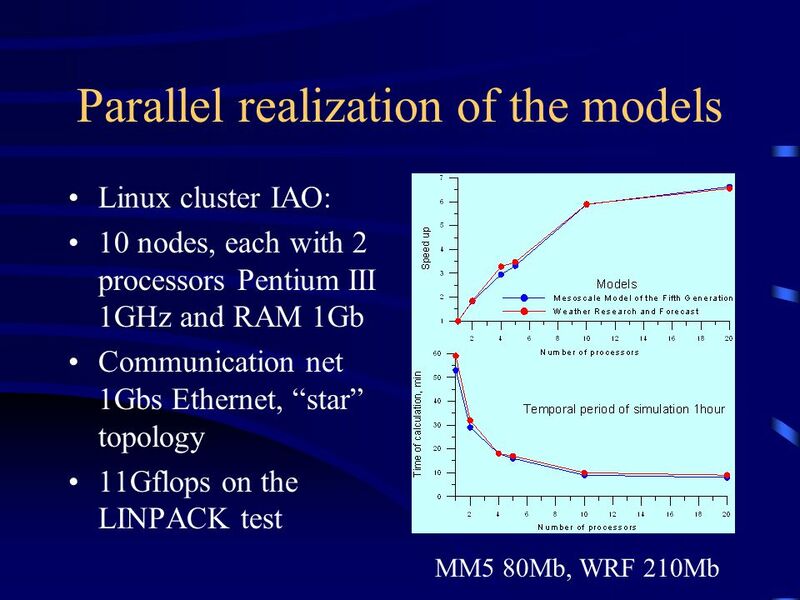 It features multiple dynamical cores, a 3-dimensional variational (3DVAR) data assimilation system, and a software architecture allowing for computational parallelism and system extensibility. 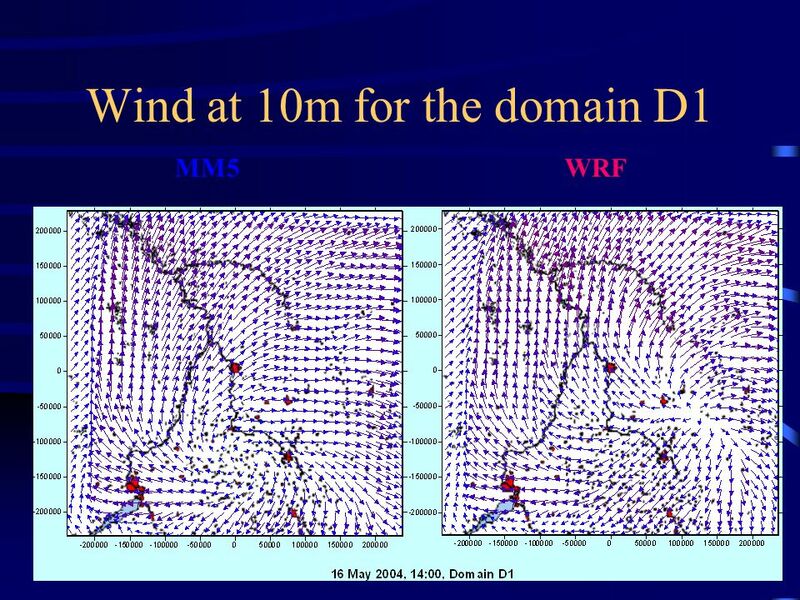 The WRF model is a fully compressible, nonhydrostatic model. 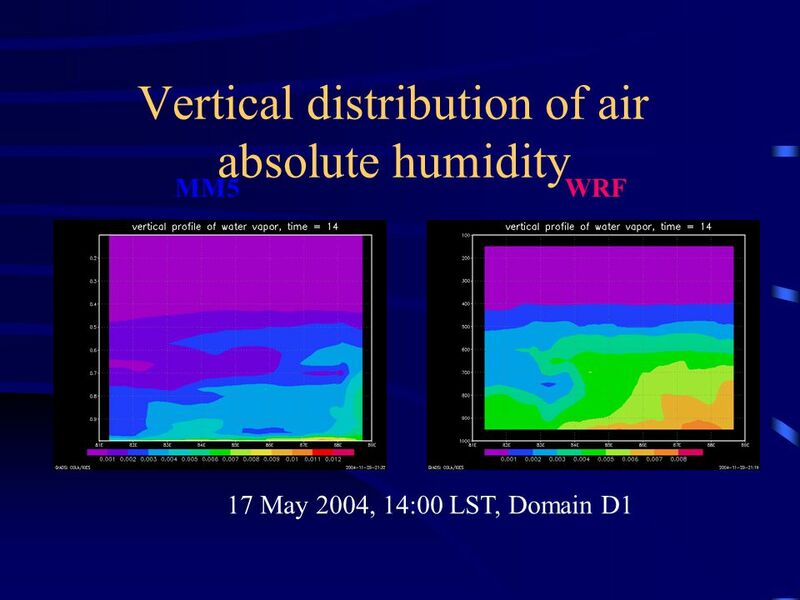 Its vertical coordinate is a terrain-following hydrostatic pressure coordinate. 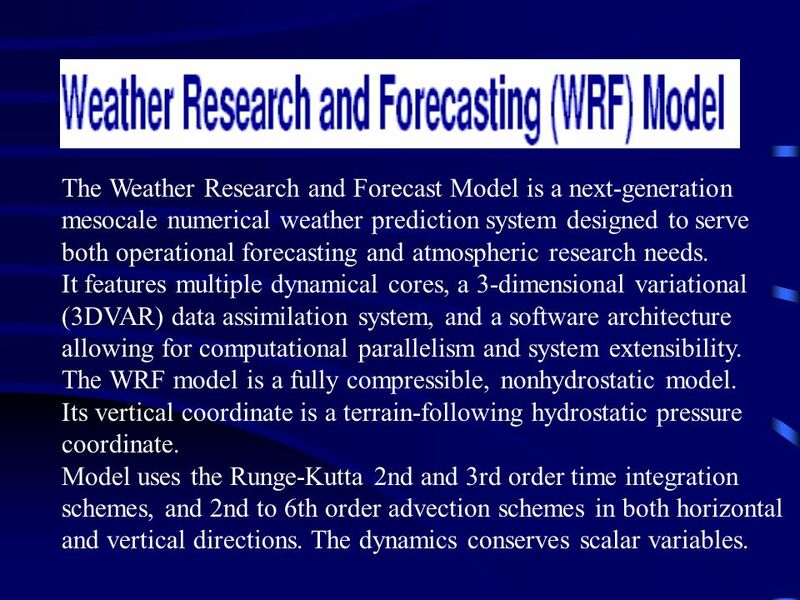 Model uses the Runge-Kutta 2nd and 3rd order time integration schemes, and 2nd to 6th order advection schemes in both horizontal and vertical directions. 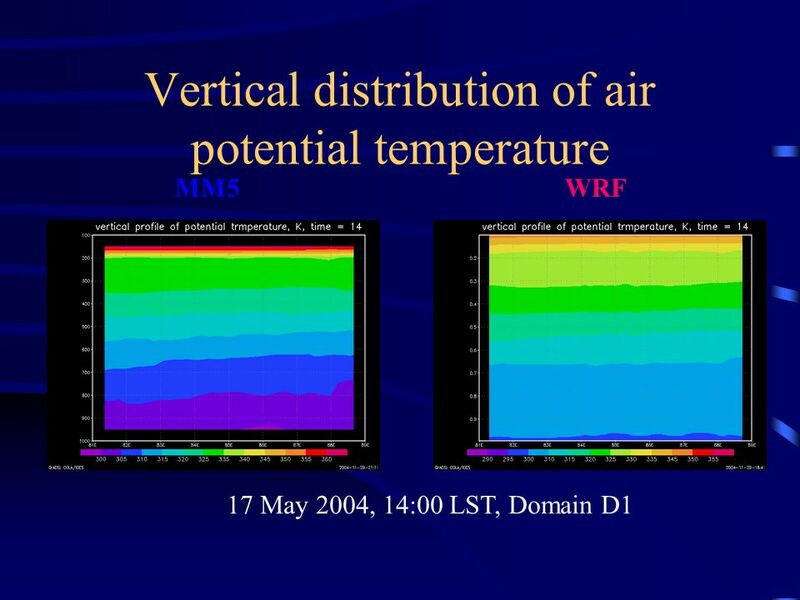 The dynamics conserves scalar variables. 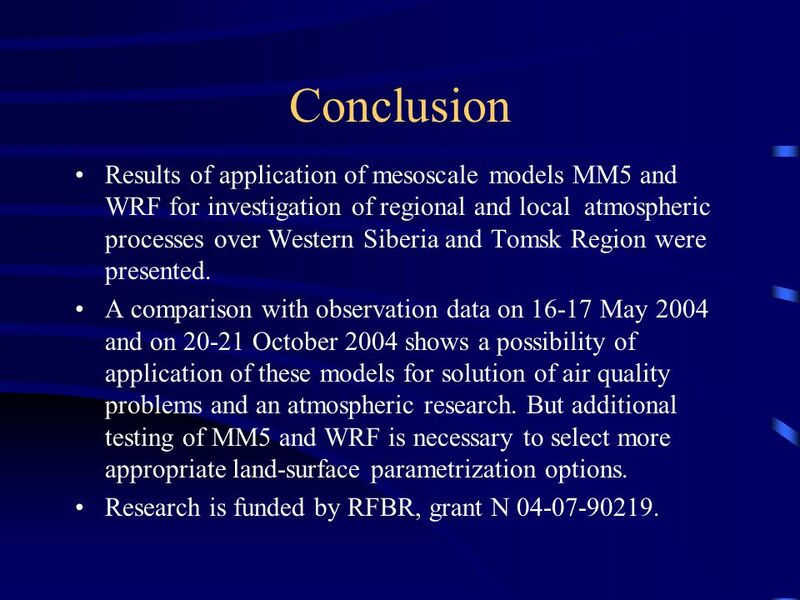 57 Conclusion Results of application of mesoscale models MM5 and WRF for investigation of regional and local atmospheric processes over Western Siberia and Tomsk Region were presented. 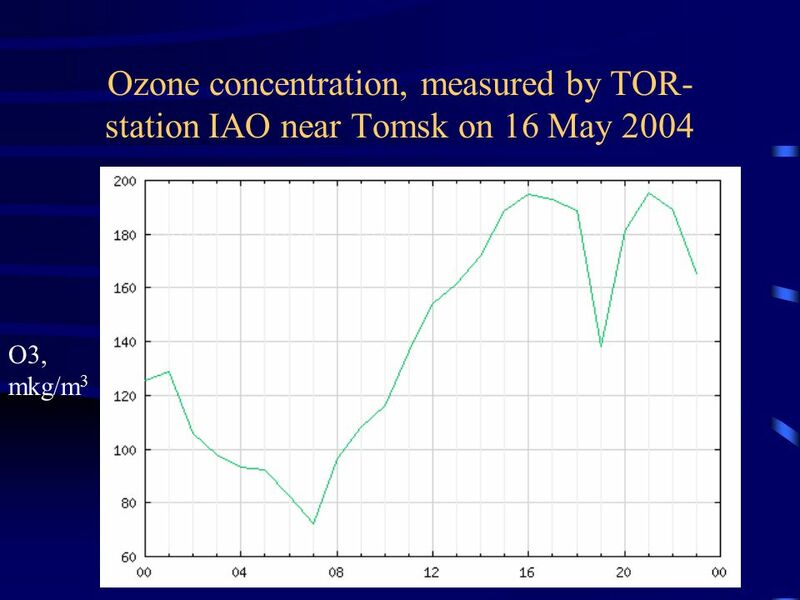 A comparison with observation data on 16-17 May 2004 and on 20-21 October 2004 shows a possibility of application of these models for solution of air quality problems and an atmospheric research. 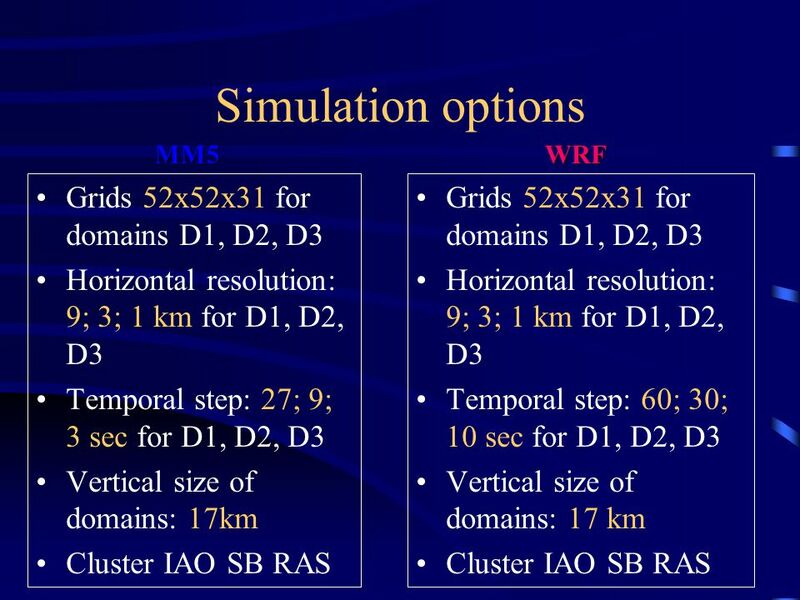 But additional testing of MM5 and WRF is necessary to select more appropriate land-surface parametrization options. 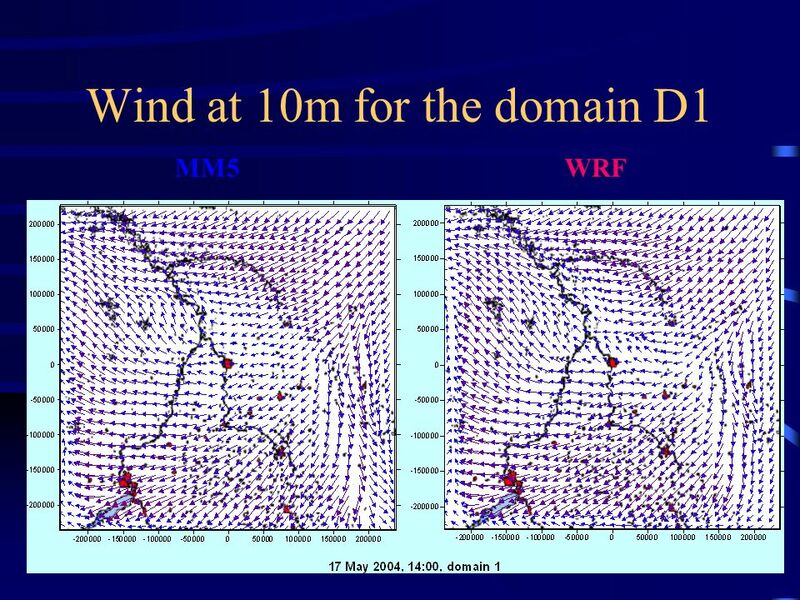 Research is funded by RFBR, grant N 04-07-90219. 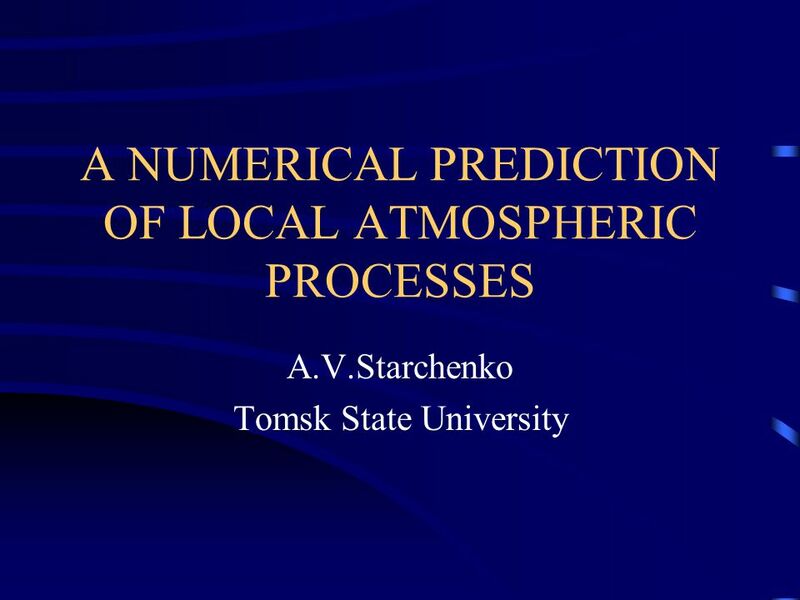 Download ppt "A NUMERICAL PREDICTION OF LOCAL ATMOSPHERIC PROCESSES A.V.Starchenko Tomsk State University." 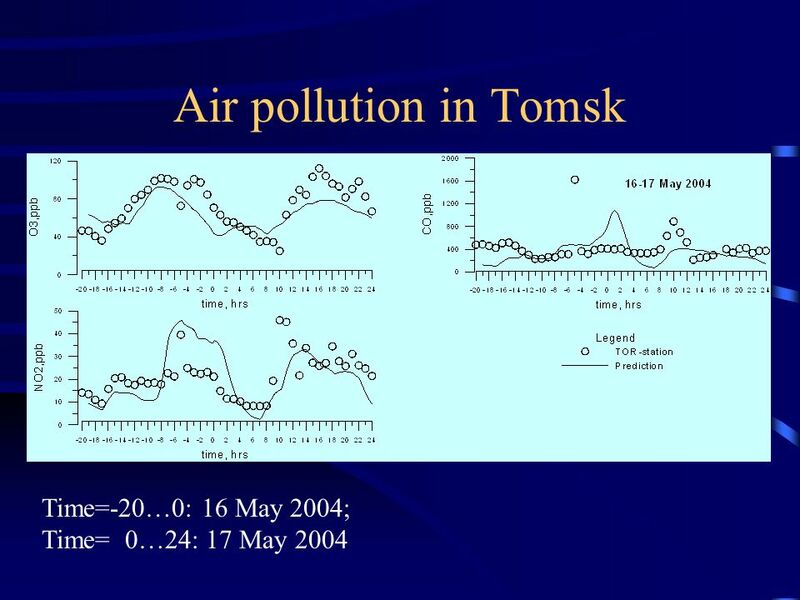 A numerical simulation of urban and regional meteorology and assessment of its impact on pollution transport A. Starchenko Tomsk State University. 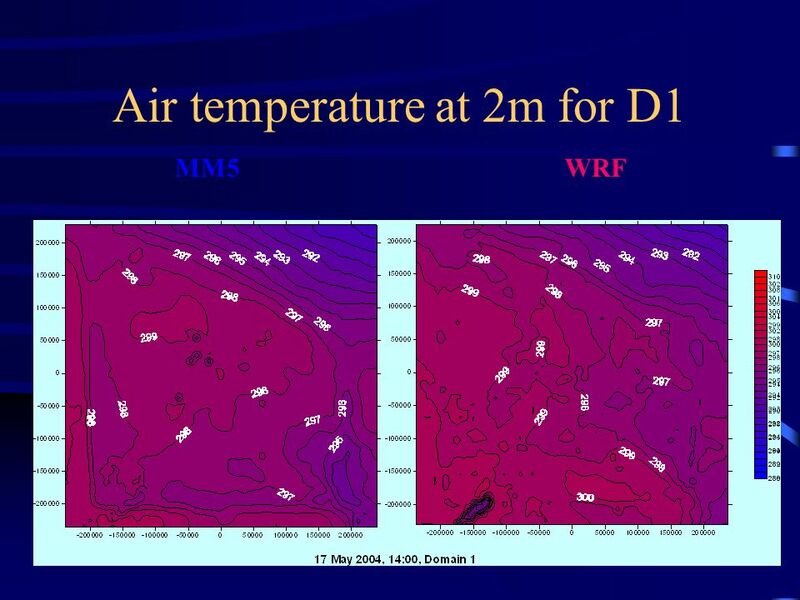 June 2003Yun (Helen) He1 Coupling MM5 with ISOLSM: Development, Testing, and Application W.J. Riley, H.S. 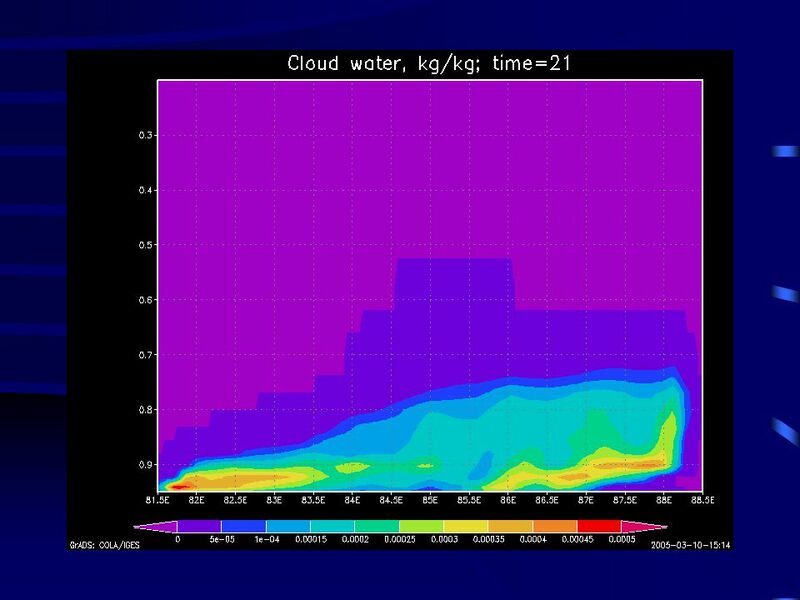 Cooley, Y. 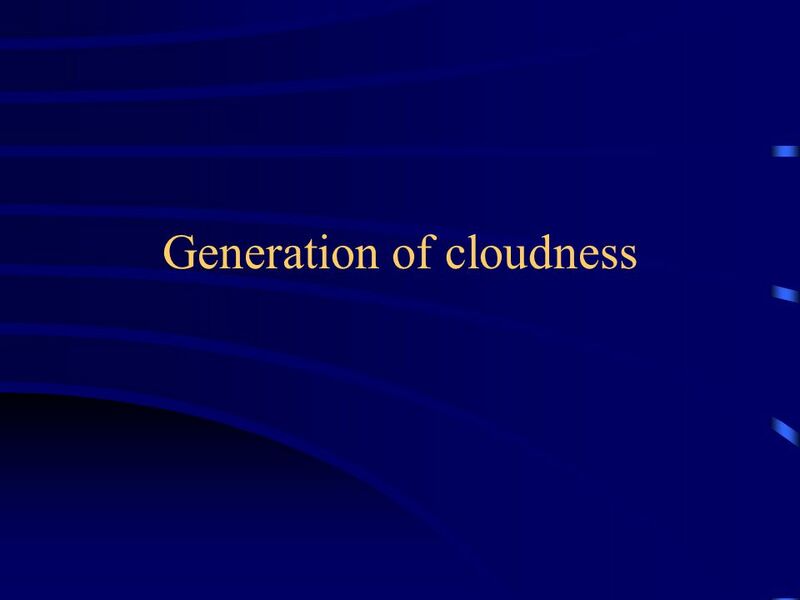 He*, M.S. 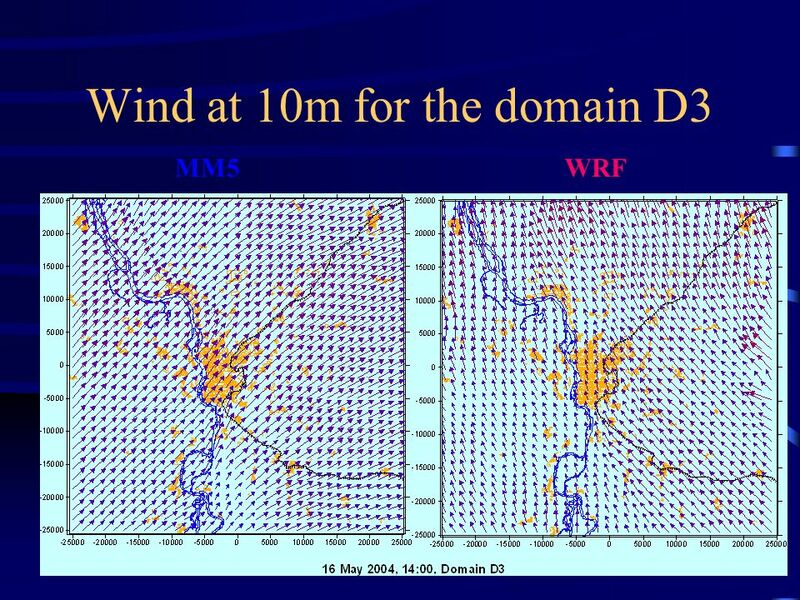 Torn Lawrence Berkeley National. 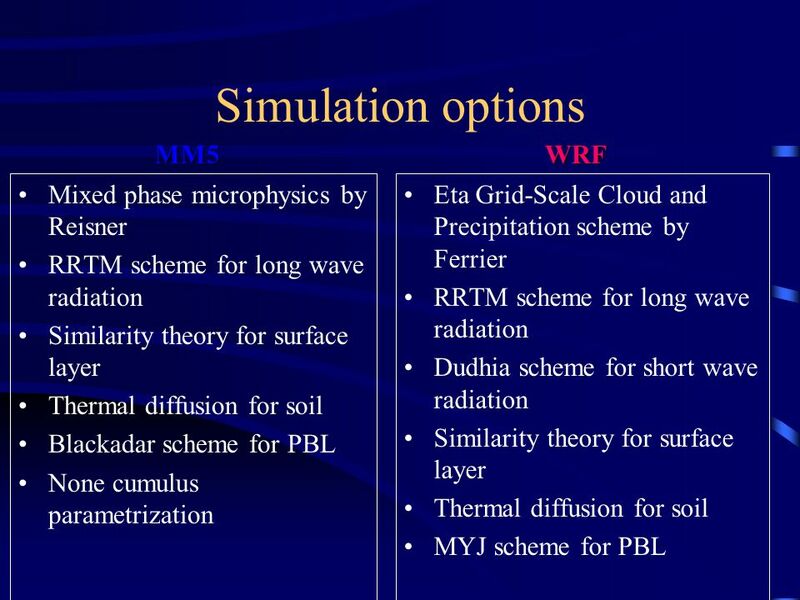 WRF Physics Options Jimy Dudhia. 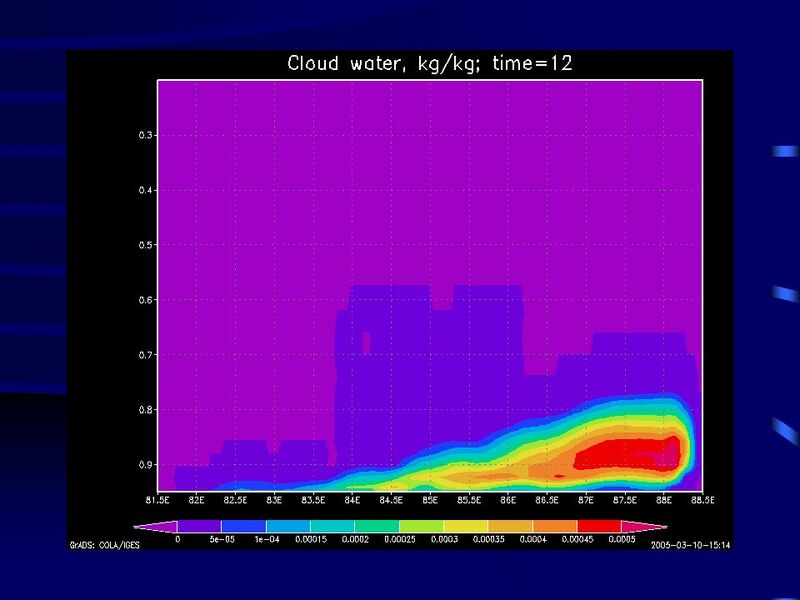 diff_opt=1 2 nd order diffusion on model levels Constant coefficients (khdif and kvdif) km_opt ignored. 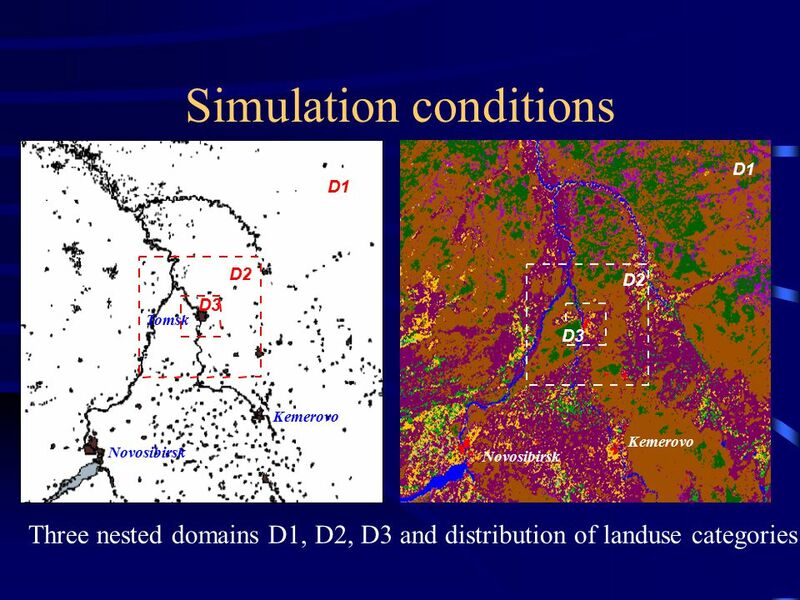 Sensitivity of High-Resolution Simulations of Hurricane Bob (1991) to Planetary Boundary Layer Parameterizations SCOTT A. BRAUN AND WEI-KUO TAO PRESENTATION. 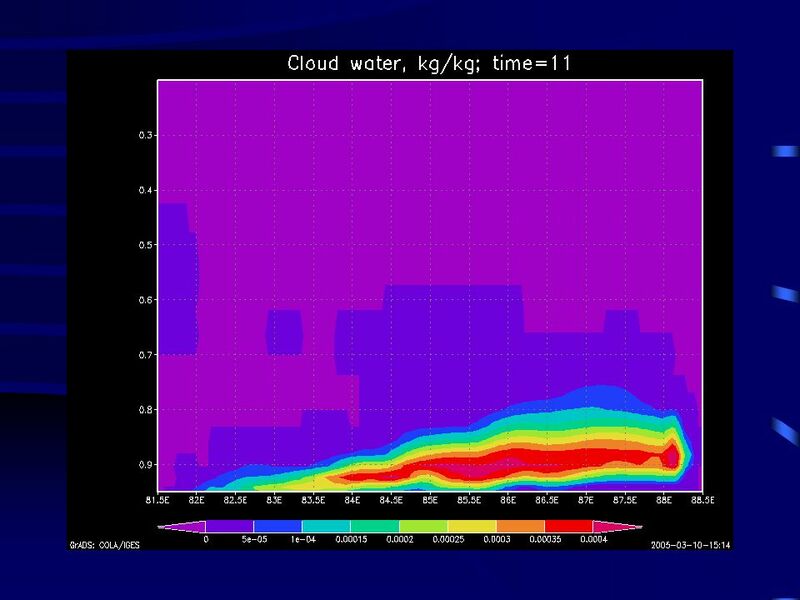 5/18/2015 Prediction of the 10 July 2004 Beijing Flood with a High- Resolution NWP model Ying-Hwa Kuo 1 and Yingchun Wang 2 1. 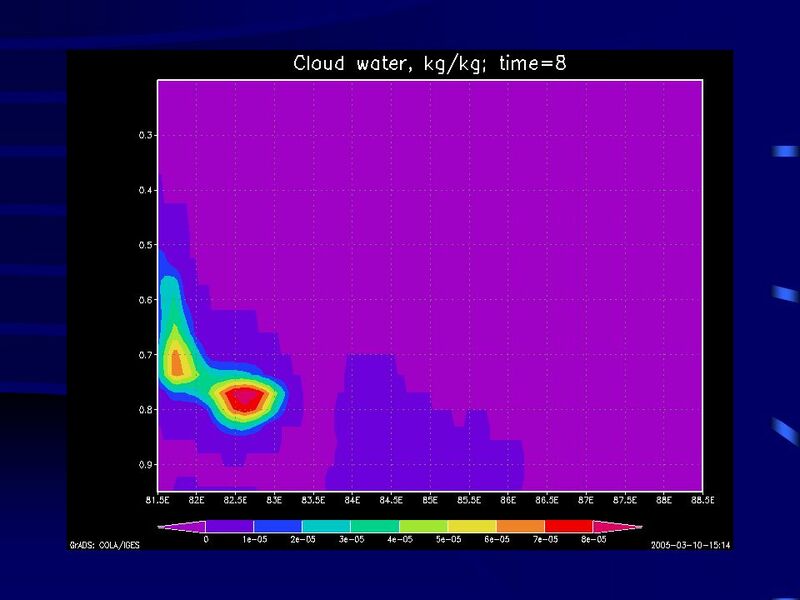 National Center for Atmospheric. 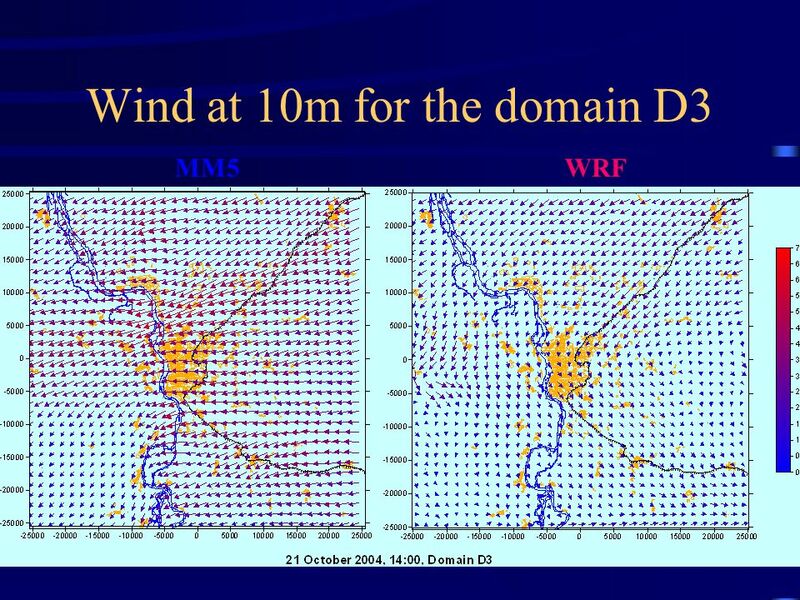 Dynamical Downscaling of CCSM Using WRF Yang Gao 1, Joshua S. Fu 1, Yun-Fat Lam 1, John Drake 1, Kate Evans 2 1 University of Tennessee, USA 2 Oak Ridge. 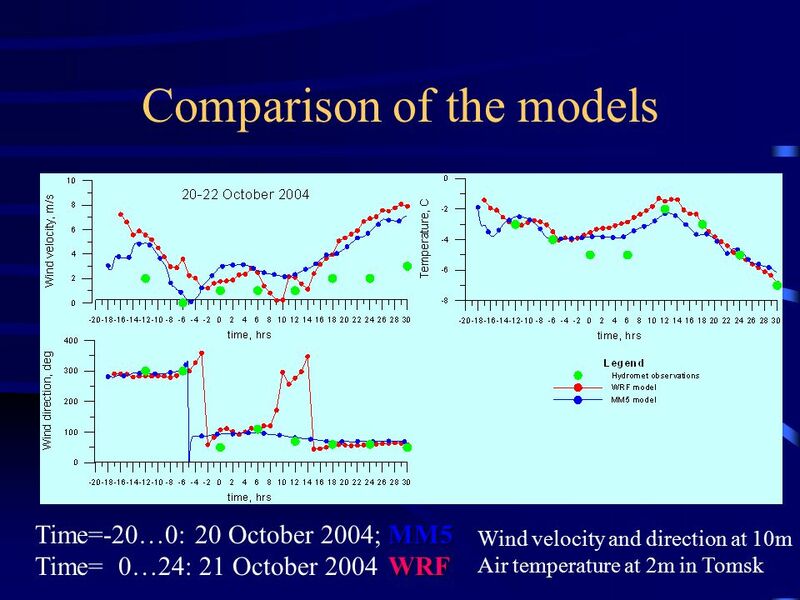 GRAPES-Based Nowcasting: System design and Progress Jishan Xue, Hongya Liu and Hu Zhijing Chinese Academy of Meteorological Sciences Toulouse Sept 2005. AIR POLLUTION. ATMOSPHERIC CHEMICAL TRANSPORT MODELS Why models? 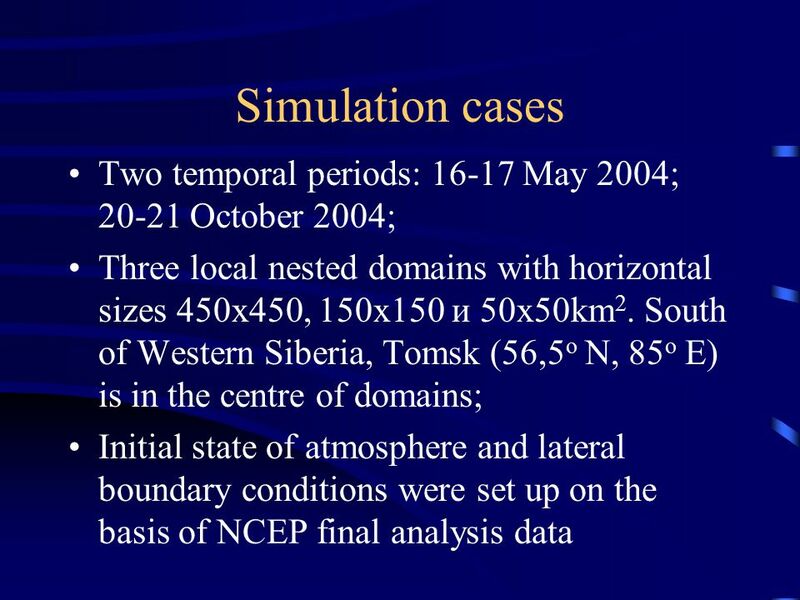 incomplete information (knowledge) spatial inference = prediction temporal inference. 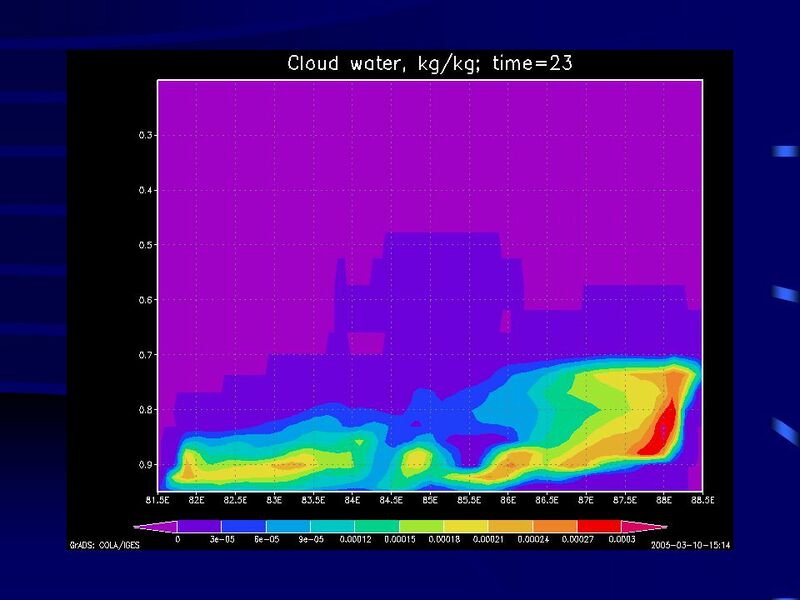 Atmospheric modelling activities inside the Danish AMAP program Jesper H. Christensen NERI-ATMI, Frederiksborgvej Roskilde. 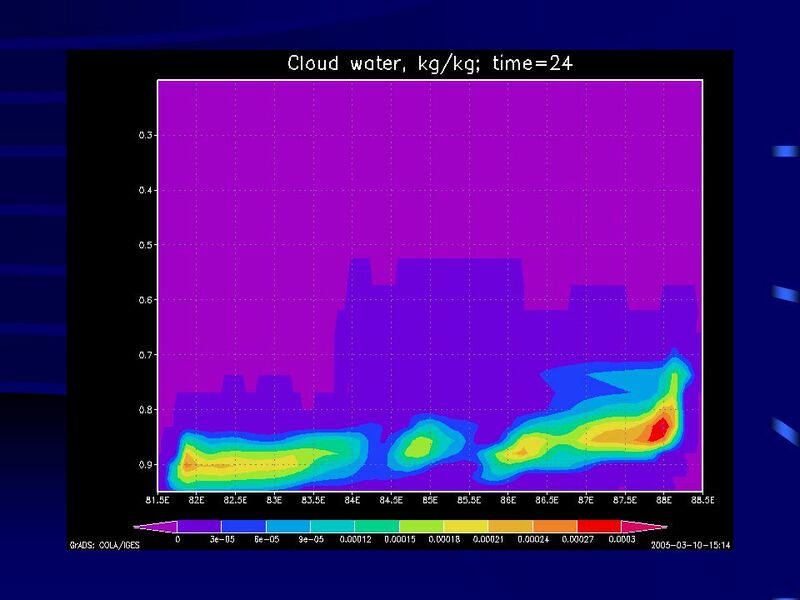 Eta Model. 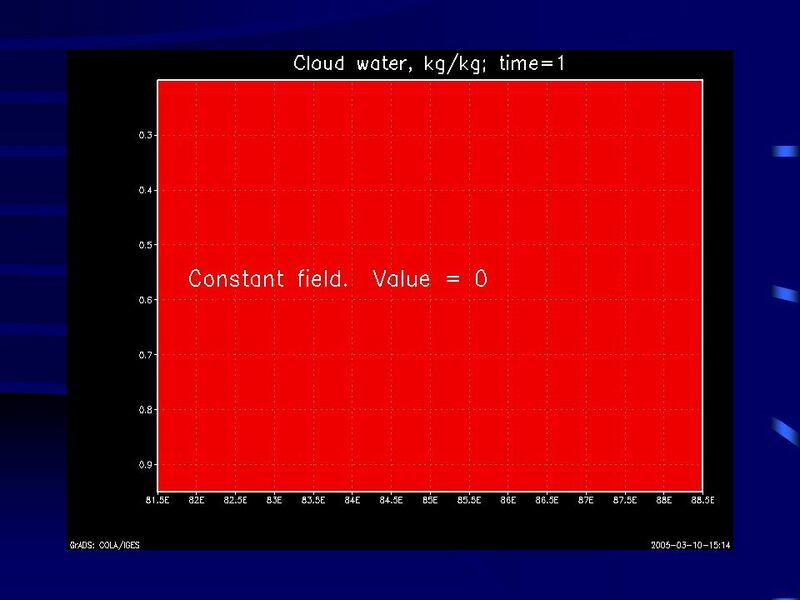 Hybrid and Eta Coordinates ground MSL ground Pressure domain Sigma domain  = 0  = 1  = 1 Ptop  = 0. Nesting. 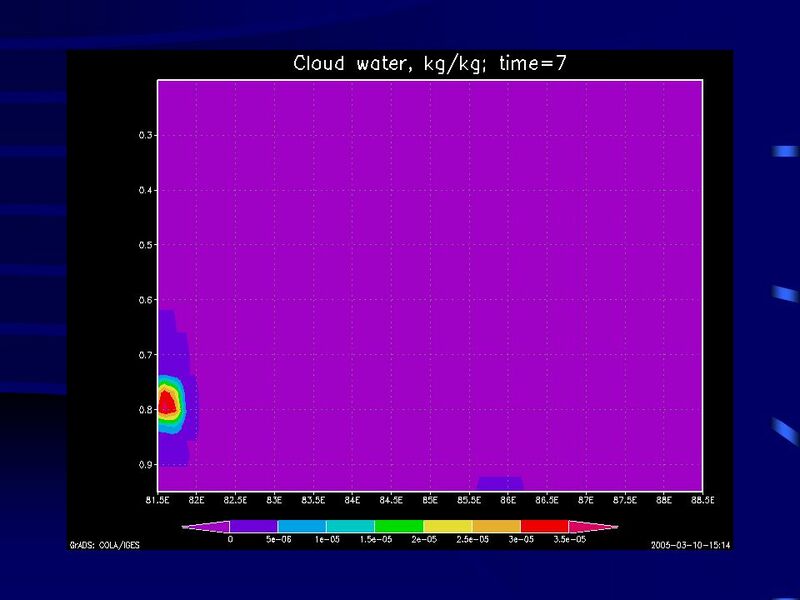 Eta Model Hybrid and Eta Coordinates ground MSL ground Pressure domain Sigma domain  = 0  = 1  = 1 Ptop  = 0. 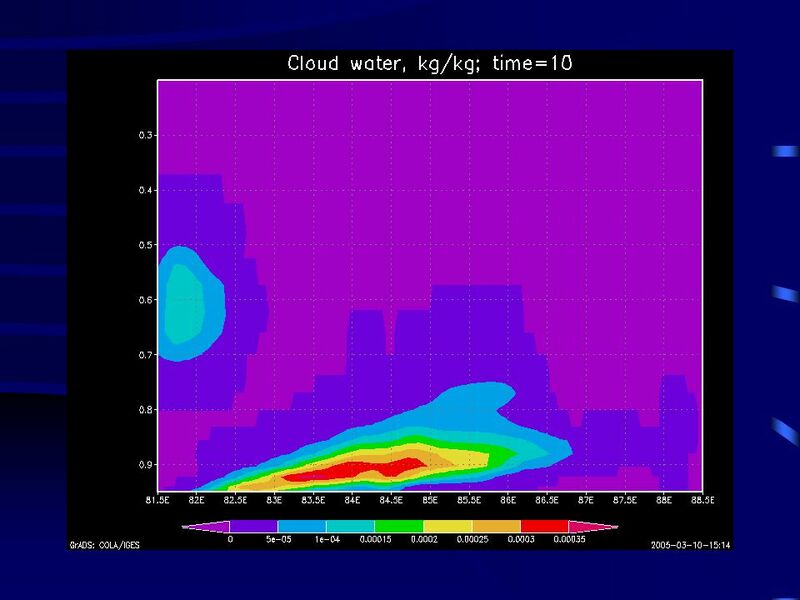 John J. Cassano - University of Colorado Wieslaw Maslowski -Naval Postgraduate School William Gutowski - Iowa State University Dennis Lettenmaier – University. 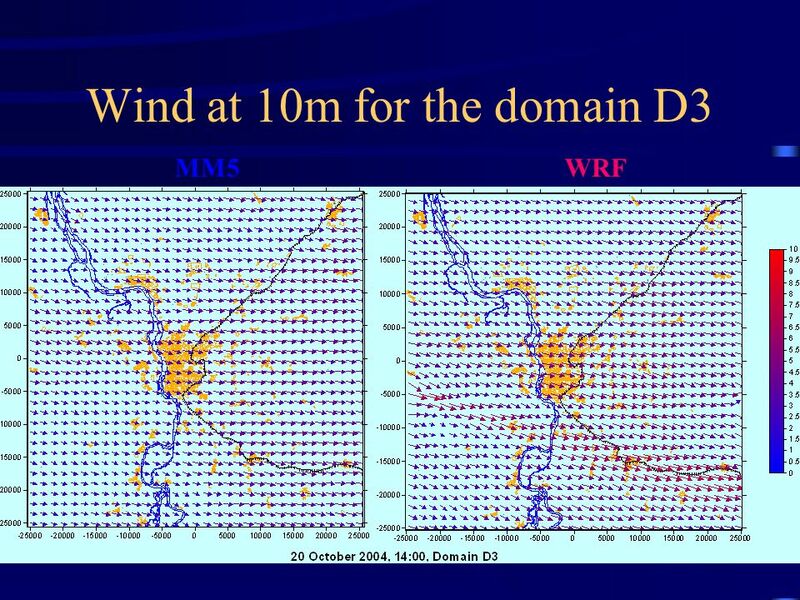 The Puget Sound Regional Environmental Prediction System: An Update. 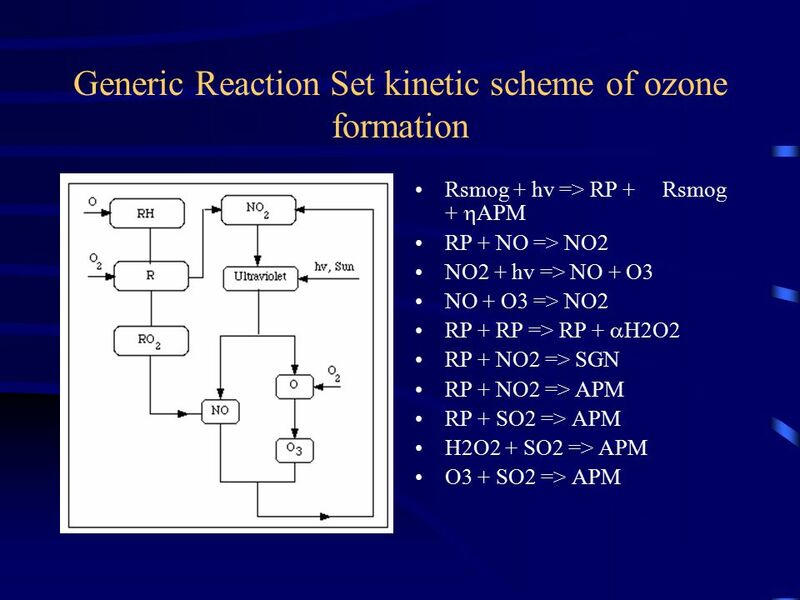 Progress Update of Numerical Simulation for OSSE Project Yongzuo Li 11/18/2008.